This challenging booklet is the perfect companion to the Prophetic Facts study on the Antichrist. Discover the amazing history of prophetic interpretation throughout the centuries, from the earliest church fathers down to Augustine, through the Waldensians and other early reformers, to Luther, Calvin, Zwingli, and Knox--plus many others. 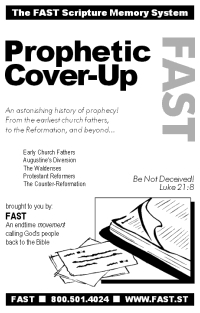 Discover also the astonishing cover-up that has taken place to mask the identity of the Antichrist today.